Apologies for the sporadic updates! Things are picking up in the studio. Here is a sneak peek at the latest pieces on the bench: One-of-a-kind, hand-illustrated rose boxes. These darlings are in the queue for some final glossing, and then they’ll be ready and on display at our next art market at the Rose Kennedy Greenway in Boston. So, please join us and have a look at our new designs at the Greenway market on Saturday, May 21st from 11-5pm. We’d love to see you there! Find us @ the South End Open Market! The South End Open Market begins this coming Sunday, May 1st! Join us there as we kick off our New England spring and summer season fairs! Visit from 10-4pm to find the latest pieces emerging from SaiLin Design’s workshop, and check out some of the other awesome art, food, and vintage goods around the market. One of the things I enjoy most about jewelry-making is the flexibility that the process lends—both in terms of design elements, as well as in choice of materials. Say you’ve been admiring that turquoise beaded necklace a friend recently wore to a party, yet you’d really prefer wire-wrapped round beads to knotted oblong ones. Rather than purchase it as-is with design qualms, why not approach a jeweler who can custom design and fabricate a piece that meets all of your tastes. You’ll be likelier to re-wear your necklace time and time again with no regret, rather than lament the expense and leave it ignored in the jewelry box. My grandmother (婆婆), Sai, for whom my business is partially named after, passed away last winter. Following that time, my mother and her sisters took possession of and split the jewelry collection she had amassed over the decades. The collection ranged from special occasion jade and yellow gold pieces to more quotidian costume jewelry. 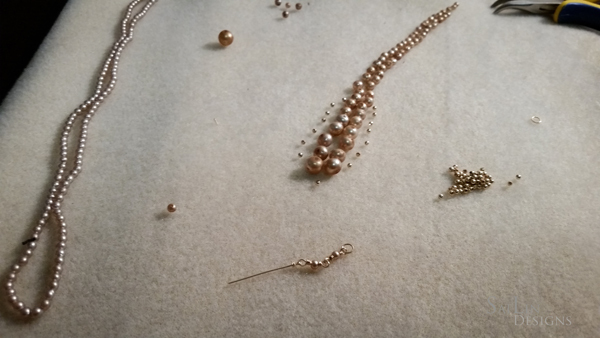 Among the items my mother chose, was a double-stranded necklace of pearlized, rosy-toned, round beads complete with a flower crystal box clasp. However, one of the strands had come loose with so much wear, and the clasp’s tongue was no longer functioning well. Some of the beads had also experienced quite a bit of wear and some of the coating was coming off. In honor of Sai’s memory, I wanted to meaningfully (and economically) gift my mother with a re-invented version of the necklace re-utilizing my grandmother’s original beads (the ones that had remained in decent condition). 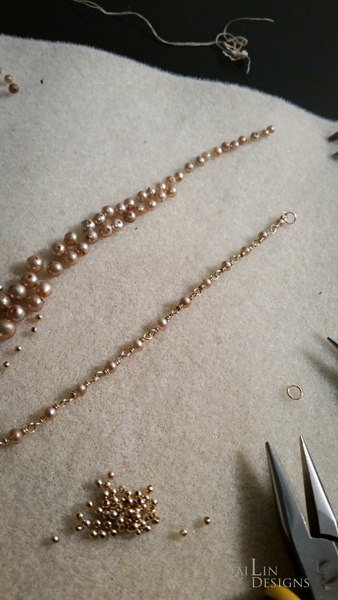 To complement the rosy hue of the beads, I wire-wrapped them into a single opera-length strand with 14k gold-filled wire and interspersed some delicate gold-filled beads throughout. I took the largest of the beads available, and transformed it into a small detachable pendant. I did the same with the crystal clasp, removing the tongue component, and converting the remainder into an alternative pendant to wear on the strand. The detachable nature of these pendants lends versatility of wear. Now my mother is able to accessorize her outfits with a restyled necklace and matching earrings that still honor her own mother’s memory and their shared simple, yet elegant taste. A couple of weeks ago, we had the pleasure of meeting Carol at the holiday boutique at the Hopkinton Center for the Arts. Having lost its twin to a favorite pair of earrings, she hoped that we could replicate her dark cranberry beaded piece. With joy and just in time for Christmas, we present Carol’s new earrings: dark cranberry freshwater pearl earrings on sterling silver! Join us in celebrating the holiday festivities at the Hopkinton Center for the Art’s Holiday Boutique! Find the perfect jewelry gift or any other carefully crafted artisan piece for your loved one. From rustic jewelry trees (featured tree above is from West Elm) to lady-like, painted ceramic wares, jewelry storage options have dug itself a nice little niche within the home and interior décor industry. However, as temptingly-stylish as those options appear, I encourage you to think twice and perhaps opt for something a little more orthodox. From left to right: Jewelry Box by HomePointe | Mid-Century Cufflinks Box in White Lacquer |Renee Sectioned Sueded Jewelry Box in Black by Mele & Co. The best way to care for and maintain the life of your jewelry is by truly treating it like treasure. Keep your pieces individually tucked away, cleaned regularly, and have your finer pieces examined by a professional on a yearly basis to make sure that your gem settings are secure. Taking these measures will help ensure that your jewelry indeed lasts a lifetime and longer. -Avoid wearing jewelry when using household chemicals such as chlorine bleach. These substances can lead to the discoloration or damage of your fine metals and mountings. Chlorine bleach can pit gold alloys. -Avoid wearing your jewelry when involved in athletic activities or rough manual work, as a gemstone can be susceptible to coming loose or chipped if it sustains a hard blow. -Make sure jewelry is the last thing to be put on when getting ready for the day, and the first thing taken off when winding down the evening. Cosmetics, lotions, and perfumes all have the potential to damage your pieces. -When storing your jewelry, keep your pieces separated if possible, so that they do no tumble against each other. This can lead to the scratching and dulling of the metal. Utilize those ring rolls and padded ring slots that you typically see in jewelry boxes. An alternative is storing your pieces in anti-tarnish soft cloth pouches or air-tight bags or boxes. -For your diamond and silver jewelry, a regular home cleaning with an ultrasonic cleaner or by hand will keep your pieces looking sparkling new. To make your own jewelry cleaning solution, mix one part ammonia to six parts water and gently scrub with a soft cloth or a soft toothbrush (one that hasn’t been used for any other purpose than jewelry cleaning, please!) to loosen dirt and restore the diamond’s brilliance. Rinse after cleaning. -If a jewelry professional has told you that your gem settings are getting worn down, avoid cleaning your piece with an ultrasonic cleaner until your setting has been “re-tipped” (the process where additional metal is usually added to the worn-out tips of your prongs and polished to match the look of the original setting). Ultrasonic cleaners utilize high frequency sound waves within a soapy fluid to remove oils and grime that have accumulated within your piece. However, in insecure settings, this can shake the gems loose from their mountings. -Be especially careful with antique and estate jewelry. Sometimes these pieces are too fragile to endure even a toothbrush scrubbing. In these cases, simply rinse the piece with some water and wipe with a soft cloth. -Be aware of any treatments that your gemstones may have undergone. This will impact how you should have your jewelry cleaned. Treated stones like emeralds are often filled with oils or resins to reduce the appearance of inclusions. Ultrasonic and steam cleaners may wind up purging those treatments from the stones, negatively affecting the stone’s appearance and even stability. -Soft gems, such as pearls, can be easily scratched. Never use detergents, ultrasonic or steam cleaners when cleaning your pearls. The GIA recommended method for pearl cleaning is using an unused makeup brush and gently brushing the pearls clean with warm, soapy water. 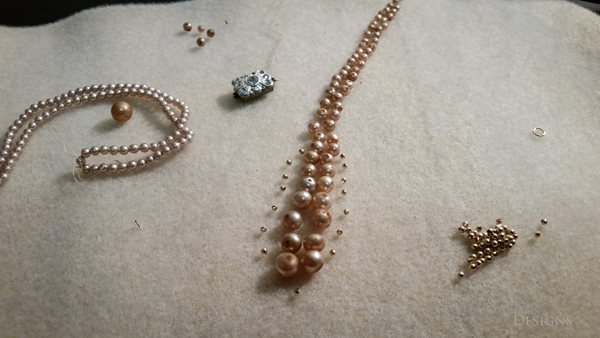 Then, allow the pearls to lay flat on a towel to dry completely before touching them again. The wet string can stretch, as well as attract dirt. -Since pearls are such a soft gem, wear and store them separately from other jewelry, preferably in a cloth bag. Storing them in a slightly damp linen cloth will help the pearls from drying out in a low humidity environment and centrally heated areas.